Hodgkinson was born in Pembroke Dock, Wales, in 1884, but was brought up in Derbyshire. 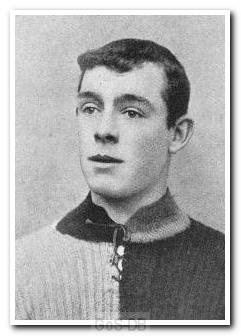 It was here that he played for Old Normanton and Hinckley Town before joining Derby County in 1903. A year later, without making an appearance for The Rams (but having starred for their Baseball team), he joined Grimsby Town and made 17 appearances, scoring 5 goals, in his only season with the club. In May 1904 he moved to Home Park and by mid-season had forced his way into the team at outside-left, a position he kept for the remainder of the campaign. Despite this he moved on after just one year with Argyle, signing for Leicester Fosse, for whom he played 33 times in 1905/06. After spending the next season with Bury he joined Southampton in May 1907 and helped the club reach the FA Cup semi-finals the following year. In 57 games for The Saints he scored 18 times and his form there led to a Welsh cap against Ireland in April 1908. Just over a year later he moved to Croydon Common and also had spells with Southend United and Ilkeston United before retiring. As a footnote, Bert Hodgkinson joined Argyle with his brother William (Bill). Like his brother, Bill had also played for Hinckley Town and Derby County but failed to make an appearance for Argyle owing to illness, and also left after just one season. Sadly, Bill died in March 1909 and a Southampton v Everton FA Cup fourth round replay was put back by a day to allow Bert to travel to his brother's funeral.